Open and airy with lots of charm. 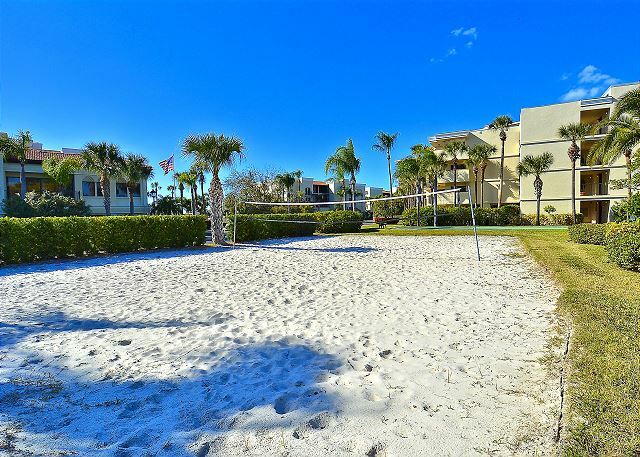 This large north corner condo has everything you need for a perfect vacation. It is completely remodeled....new bathrooms, new kitchen, new flooring! Rows of windows open the space to an expansive view of the Intracoastal Waterway (Boca Ciega Bay) from the living room, dining area and the kitchen. Located in the popular Sunset Beach neighborhood, this lovely condo has a fully equipped kitchen and comfortable décor. The double size balcony is a great place to watch for dolphin, sea birds and boats on the water right outside your sliding doors. Free internet service. Land’s End is located on Treasure Island at the end of a peninsula and surrounded on 3 sides by water; the Intracoastal Waterway to the east, a pass to the south and the Gulf of Mexico to the west. 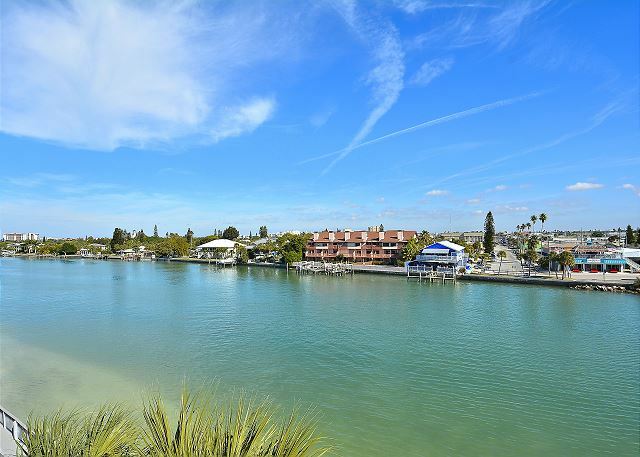 Land’s End is approximately 3 miles South of John’s Pass Village on Madeira Beach which is filled with shopping, restaurants, water activities and entertainment for all. Feel like riding some roller coasters while in town? Busch Gardens in Tampa is only a 45 minute drive away, or hit the Disney parks and all the other Orlando attractions within 2 hours. 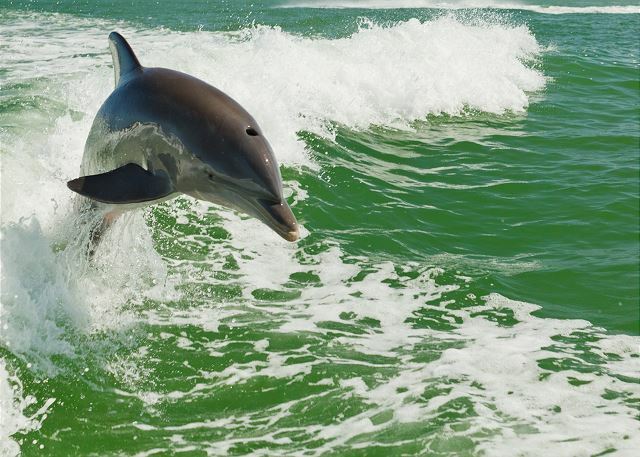 The Florida Aquarium in Tampa, Clearwater Aquarium (Home of Winter the Dolphin), Hard Rock Casino, beautiful state parks and miles of beaches are just a handful of reasons to visit our Pinellas County beaches!!! Being a gated community at the end of the road Land’s End will truly allow you to step away from the hustle and bustle and get that much needed R&R, yet keep close to all that you need to make this a perfect vacation destination. This was our 2nd stay at Land's End and we were not disappointed. The complex is maintained at the highest level and as condominium owners we really appreciate that. Our unit was clean and current in finish. It has a spacious double balcony overlooking the bay side and we sat out there many hours. We have already booked for May 2019 and are excited to return. The pool area is pristine and we never had an issue finding open lounge chairs. 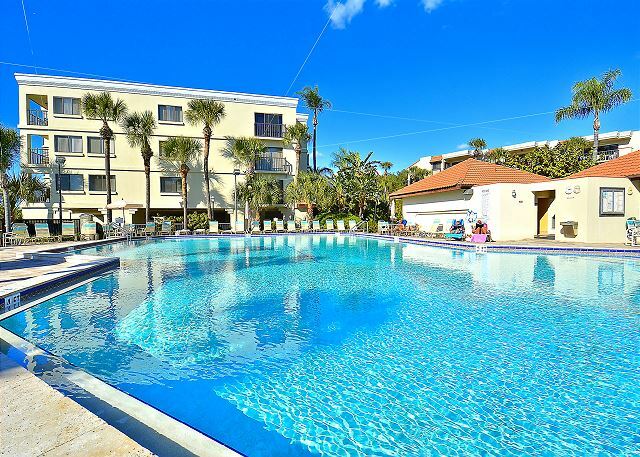 We alternated days between the pool and Caddy's on the beach which is only a few minute drive from the complex and a whole lot of fun. Parking is only $5 and chairs are free. Good food and drinks at reasonable prices. Just the kind of laid back spot we look for on vacation. Couldn't have been better. As a family with two kids aged 8 and 12, we love chilling on the beach but we also like having a communal pool but one that isn't too busy. This complex offered both. The apartment was clean and well presented with some beach gear included. In terms of location it couldn't be better. You have St Pete's just south as well as Clearwater 30 minutes north. The downside was having to leave! We hate that you had to leave as well!!! 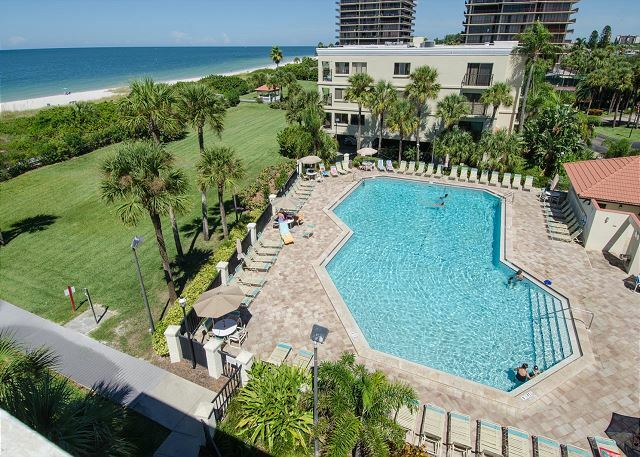 :-) So glad you had a good family vacation and enjoyed our area as well as this premier condo in our inventory! Hope to see you back again soon! VEry happy for the second year in a row. WE were back for a second year in the same unit. We really enjoyed Land's End. Unit was just like last time very nice, big and clean. Being at the end of the road we really like being alone at the beach. Kids and run around without any worries of loosing them. What is missing from this condo are supplies. No soap to wash dishes, no cleaning products for counter or even the top of the oven. You have to bring your own beach towels. There are white shower towels. COndo was well equipped with all the beach gear, chairs, toys and umbrellas. Glad you enjoyed this premier beachfront condo at Land's End and like the location of the property!! We are sorry if you did not find the basics for cleaning in this condo. We do not provide any chemical items in the condo unless specifically left there by the owners. Beach towels are not a required item for the owners to leave as we have found they go missing on a regular basis, which is unfortunate for everyone. Bath towels and linens we do supply. We are sorry if this was any inconvenience for you during your stay. Glad to see all else was good and we hope to see you back for another visit!! Everything was great! We had a very pleasant stay. The only complaint I have is the cleaning lady showed up at 730 on check out day. We did not have to check out until 10. Oh gosh, that should not have happened and we are really so sorry for any mix up that may have happened there with that! Check out is at 10am and we are so sorry for any disruption to you before that time. We are glad to hear that you enjoyed everything else and hope to see you back for future visits. We had an awesome stay. Walking on the beach to seeing dolphins in the canal. The pool was wonderful and warm. The condo was very nice and the view was wonderful. We will definetly be back soon. Unit is very nice, super clean. The Land's end complex is amazing because it's calm. Gated Community, super clean and well maintained complex. This particular unit had beach toys, chair and beach umbrellas. The river view is beautiful and bonus you get to listen to live music from the bar across the river. It's not so loud that is is annoying and you can't hear it from inside. We saw manatees and dolphins on our balcony. Wonderful to hear!!! We are so glad you were happy at this location, it really is awesome! Thank you for staying with us and we hope to have you back for another beach getaway soon! ALL ASPECTS OF STAY EXCEEDED EXPECTATIONS. THE UNIT WAS FRESH AND UPDATED. We have stayed at Land's End before on several occasions, this condo was by far the nicest. Lots of towels and dishes, beach chairs and beach toys. We did have issues with the lock on the front door. Would definately stay in this unit again. Thank you for your post! We are so glad to hear you had another nice stay at Land's End. This condo that you stayed in, #401 in building 4, is one that is in our premier category of condos which means it carries recent updates. We are so glad you enjoyed!! :-) We look forward to having you stay with us again soon!! Our experience at Land's End was wonderful. I highly recommened the property plus Resort Rentals as their agency. Resort Rentals helped us out of a tough spot when we arrived due to another company backing out of their commitment to park our trailer. They were amazing! We had a great stay at Lands End Unit 4 Condo# 401. the unit was large, clean and had plenty of space for my family of 6. Renting through Resort Rentals could not have been easier - they were very helpful all the way up to check out. Will definitely be going back!! Even better than the pictures!!! We have stayed in the Gulf Coast area many times, and this was by far the most satisfying experience we've had. Treasure Island is beautiful and the atmosphere is laid-back, but you're a short drive to all the "Action". The Condo is exactly as described: Large, Clean and Updated. Location and view were perfect, and the east-facing balcony was very comfortable in the afternoon & evenings (out of the sun). The complex was clean and well maintained, and all of the employees we met were courteous and helpful (dining advice, etc). We read some prior reviews about the staff being overly strict enforcing rules at the Pool, etc; we saw none of that. The pool was crowded with families daily, and a fun time was had by all. We would ABSOLUTELY rent again at Land's End, and would certainly request this same Unit. Wonderful place to be away from the cold. the pool is lovely and the beach is nice and private. Condo is as pretty as pictures shown, well furnished and very large. Walk in showers were great but a hand bar in each would be helpful for older guests. Plenty of towels even beach towels. Loved the bay view and the activity there on weekends. Beautiful pool,residents very friendly. Going back next year to same unit. Hint: bedrooms seemed cold and realized registers are high on walls near ceiling so turned ceiling fans on low in clockwise position on days when furnace was needed,and problem solved. Have been snow birding in the area for 14 years and must say Resort Rentals staff was the best! All were very knowledgeable over the telephone with operating instructions regarding tv, dvd, and such. Had a problem with ice maker and it was taken care of in a very timely manner. I was most impressed with Resort Rentals. They are great! We stayed in this specific unit and were very happy when we arrived. This was our first time using VRBO and had researched as much as possible. We had spent our first week of vacation in Orlando and our second week here, on Treasure Island. It was a little unusual going from one condo to the other, but we were so pleased with the location and the inside of the unit...we couldn't have made a better choice. The unit had everything we could want in it. The kitchen was fully stocked. Everything in the unit was in good condition. It was very clean and well kept. We couldn't have asked for anything more. We had a wonderful time & we loved the condo we stayed in. Great weather all week. This is our third year staying at Lands End & will be back next year. The unit was excellent. Resort Rental staff were friendly and very helpful. That is why we come back year after year. Our family loves this complex and specifically this unit; the complex is very private and safe with immaculate grounds. You can't beat the location with water on three sides. 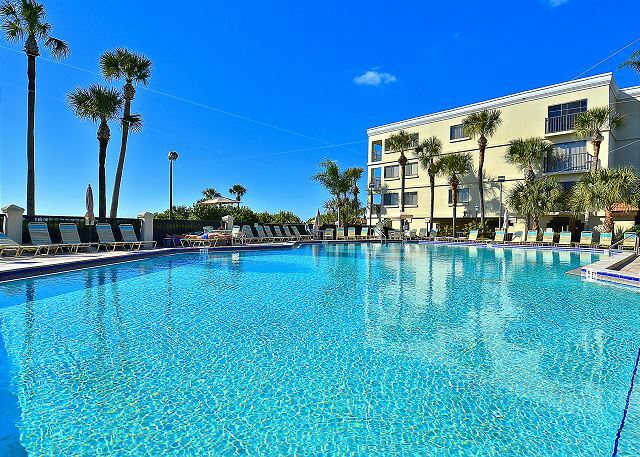 You are within fifteen minutes of many great restaurants, many of which are on the beach or waterside on the intercostal. Their is shopping, all kinds of watersports, a grocery store about 5 minutes away. Also, downtown St Pete is very nice - on the waterfront and facing a beautiful park and marina. There are many chic spots if that fits your gig. Also the Dali Museum and Chihuly permanent exhibit are also downtown, again a very easy 15 drive from the condo. Also love the reserved on grade covered parking just steps from the elevator - so your car stays cool in the shade. And lastly the condo décor is very modern, clean and bright as the end unit has lots of windows/sliding glass doors - the east facing direction is our choice to be in the shade in the afternoon/evening so we sit out on the balcony frequently in comfort as opposed to the west facing ocean view where the afternoon sun makes it too hot to sit out on the balcony. This was our second stay at Lands End. This condo was perfect. Thank you. check in was smooth as well as check out. Condo was so clean and nicely updated. We enjoyed everything. The only negative is about the other property owners which is not anything the rental agency can control- but they are rude to guests and made it very clear they do not like young kids at all. Land's End, clean, quiet and convenient. The management company staff was super friendly and easy to work with. Upper corner, top floor unit was very clean and modern. Views were beautiful as was the area. Across the water way on the weekends the bars had live music-very enjoyable. And because we stayed over the New Year we got to see quite a few fireworks from the balcony at midnight. Rental staff very professional and questions answered promptly. Hot tub by our building was almost like having a private one. Best time we ever had in Florida! I don't ever write reviews for my vacation, however, this time was exceptionally wonderful, I feel I owe the owners my gratitude. We had so much fun, the unit was clean, beautiful, and very convenient. If you like the ocean, it's back of the unit, if you like the calm waters of the bay, it is right outside the window. We love the beach chairs, big fridge and the showers! Fishing is great, you even see dolphins every day! My husband and I are considering retiring there in the future. Highly recommend to all! A beautiful condo which was exactly as portrayed in VRBO. Alles war perfekt, bis auf die Schlüsselübergabe durch den Vermittler! We have been coming there for several years, and we absolutely love it. The location is fabulous - on the end of a peninsula, very private, gated for security with water on three sides! We chose the intercostal side facing East so we did not have the afternoon sun glare off the water and heat from the sun - it was so nice to sit out on the balcony every evening in the shade and listen to the music from the establishments located across the intercostal. Also nice being on the top floor - we never heard anyone else! We also loved having a reserved parking space located on the ground level covered by the building above - again no hot sun to deal with. There are many restaurants and fun activities within a very short drive. The condo is wonderful - very nicely done throughout - with granite countertops and very modern glass shower and tile bathrooms (2);also a lot of storage space and the washer/dryer was very handy as well. The uniteis very bright with many nice windows and two large triple door sliders to the large balcony. We will definitely stay here again - highly recommend to anyone wanting to stay in the area and on the water. I love staying at Lands End except for one gate keeper. He is African American and very un professional. He hassles people and should be spoken to. This hassle is enough to cause me to not re book next year. We loved our stay at Land's End. The property is beautifully maintained and off the "beaten path" yet in the middle of everything. Our unit was exactly as advertised - bright, clean, updated. We would definitely stay here again. Overall we enjoyed our stay in this unit. There were a few issues when we arrived but they were quickly taken care of. We would definitely return to this complex for a vacation. The unit is great. Very nice since the upgrade. We had 2 problems: The telephone did not work when we arrived but Resort Realty had the desk phone fixed immediately. The wall phone never worked during our stay but wasn't a problem for us. We also had a problem with dishwasher, which was not reported to Resort Realty. The dishes were covered with the dry residue when we arrived - everything was hand-washed so I knew they were clean when we used them the first time. I think the problem might be the water in Treasure Island. The dishwasher did not clean the dishes - each item required scrubbing with a Scotchbrite pad before running the wash cycle. Otherwise a food residue was baked on everything (I always rinse dishes with a brush before loading, so it wasn't an excess of food on the dishes). Further, all dishes, especially anything made of plastic, had a dry residue everywhere. I cleaned the dishwasher filter, filled the rinse aid dispenser with the rinse aid provided, used the dishwashing powder provided, used the dishwashing compound that I use at home, ran the machine without rinse aid, and the only thing that seemed to cut down on the residue was to use 1/2 as much washing powder and leave the cover to the powder bin open. It was easier to hand-wash the dishes than to use the new machine in the unit. I wanted to let you know about our efforts because you might get pushback from other guests about the same problem. I truly believe the problem was not the result of anything we did...we did everything we could think of to make it work. If there are specific steps we should have taken, we would like to know what they are. Other than the dishwasher problems, we were very satisfied with our stay, and look forward to staying in the same unit next year. Resort Realty is a great company to work with. Thanks so much for your review. I am so glad you were happy with the newly remodeled unit! To answer your question about the dishwasher, I am sure the dishwasher was fine. Unfortunately we do have hard water in our area. Government mandates now band phosphate in dishwashing detergent causing them not to clean as effectively as before. The law hopes to keep phosphates out of anything that ends up in the waste water or any water that could end up in lakes. The phosphate makes the algae grow, which takes oxygen out of the water and supposedly suffocates aquatic life. Hopefully they will be able to reformulate the detergents to solve this issue. Thanks again for your high ratings! We hope to see you again next year. We had a wonderful time when we stay at Land´s End. - A beautiful place to be! We really appreciate - thank you very much! We love this location, the unit floor plan is very comfortable. We will definately go back. This property is great for a relaxing vacation. The private beach, the pool the beautiful grouds all located close to resturants and shopping. We will be back again. We loved the Land's End community and location. Enjoyed walking the boardwalk around the development. Beautifully landscaped and maintained. Played tennis, shuffleboard, and volleyball along with relaxing in the lovely community pool. Our joy was the beach, walking, playing in the surf, watching the sunsets. 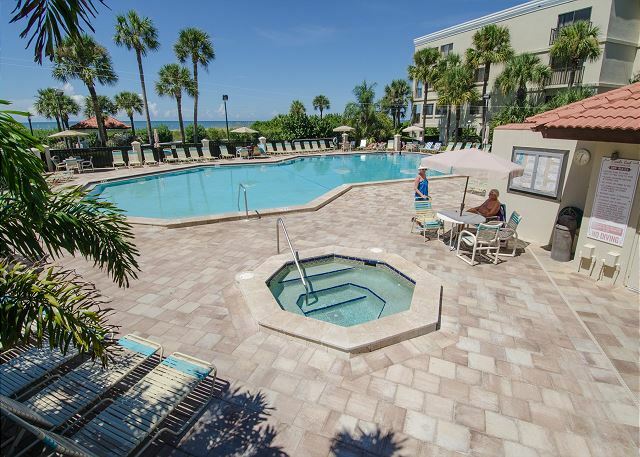 We loved the coastal communities and also enjoyed the proximity to St. Petersburg and Sarasota. Our unit was in need of a make-over which I understand is planned for summer 2012. The only noise problem was on Thursday night (college night) across the canal at the Slippery Pelican. The party went strong until well after 2:00 AM. If I were a little younger I would have joined them! I noticed a sign posted in our condo that a complete renovation would occur Summer 2012. One recommendation for your renovation would be a sun screen on the patio off of the main room. The morning sun is tremendous and there are several birds that steal things off of this patio. We thoroughly enjoyed our stay and hope to be back Summer 2013. Thanks so much for your great review. I will pass on your recommendation for the renovation to the owner. We hope to see you again in 2013! Sarah R from Columbus, oh does not recommend this vacation rental. The condo was really nice; the management company was great; the complex was nice. The only problem was the pool monitor. We have three children who love the pool. The pool monitor was constantly reprimanding our children and everyone else's children. If they had a ball, it got taken away from them. If they had floaties on their arms they had to take them off. If they took their goggles off and put them on the side of the pool the monitor would come by and get them. It really made families feel VERY unwelcome. If they don't want children at the pool don't rent to families. We will definitely come back to this area next year and will definitely use The management company but will definitely NOT stay at Lands End. The only problem were light bulbs were missing from bathroom. A truly enjoyable time, we will be calling again to make arrangements for next year. It was great time with a great beach and beautiful weather to boot.The staff who worked at site were pleasent and helpful. The fishing and sun bathing were great! We will be back! furniture, Definitely would rent this unit again. Lands End and Resort Rentals is the best! As mentioned on the form that I submitted to your office. Unit 4-401 has one problem that should be corrected by the owner, DOORS. Please review my previous form that you have. Great relaxing quiet location on the beach. Only improvements could have been: porch sliding door latch system was broke; carpet and living room furniture could use steam cleaning. way to strict at pool!! We had a great experience from the very beginningwith booking thru ResortRentals to the wonderful two weeks in our condo,loved the location of Land's End. 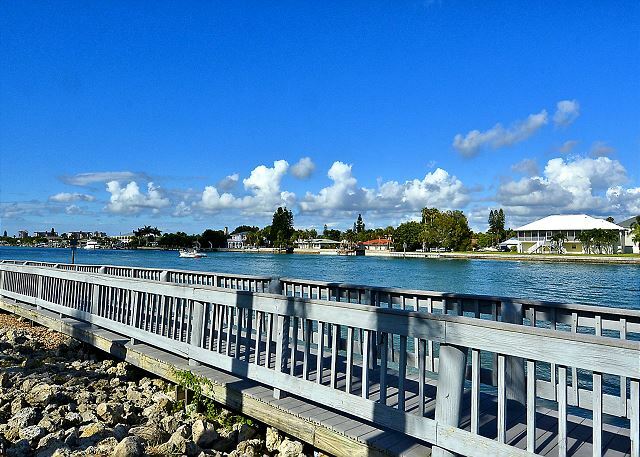 The Intercoastal on one side, the Gulf on the other, with a walkway all around the property. Very quiet and yet close enough to get to places for dinner and activities. We call Lands End our 2nd home as we have been vacationing there for many years ! 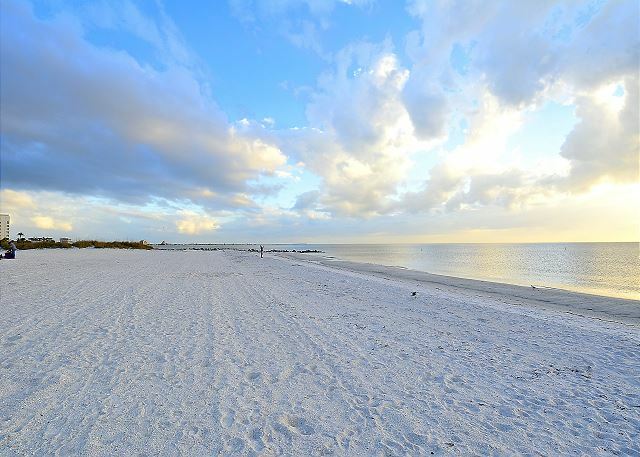 Its always a wonderful time spent on the beautiful beach and pretty surrounding's of the area. Can't wait till our next trip and GO BUC's !!!!!! It was our third time staying at Lands End on Treasure Island and we will definately be back. Resort rentals was very helpful. Weather was great but the kids were a little dissapointed the ocean was so calm they could not even use their boogie boards. Back bay location was really nice and the view over to the Sloppy Pelican and Philthy Phils added some entertainment. Was half temted to jump in and swim over one night jk. It was a one mile walk to the two nearest restaurants a bit far for me not wanting ti drive everywhere. Shopping was a little bit farther, too far to walk. That was a bit of a problem too. The friendliness at the Ka'Tiki Hut was great and overall it was very good.We had a very good time. We have been going to Land's End for over 20years and it is always perfect. Clean, great location, quite. Love it. Thanks.